"Bach affected everyone after him, so it’s important to hear the musicians before"
The Hong Kong Philharmonic has a special treat for us this fortnight as guest conductor Case Scaglione collaborates with violinist Caroline Goulding and, on the piano, our SAR’s very own Colleen Lee. The trio, along with the Phil, are presenting a programme of works at the Hong Kong Cultural Centre that combines music from the Baroque and 20th century periods. Of particular interest is Johann Sebastian Bach’s recognisable Concerto No 5 in F minor, originally written for the oboe but immortalised for the harpsichord. This is where Colleen Lee is expected to shine on the ivories. Lee is the first-ever Hong Kong-born pianist to finish in the top six of the International Chopin Piano Competition. In 2005, she came sixth, setting up her career as a star performer. Prior to that triumph, she studied at the Hong Kong Academy for Performing Arts from the age of four and she graduated top of her class in 2001, continuing her studies at the Hochschule in Hannover, Germany. 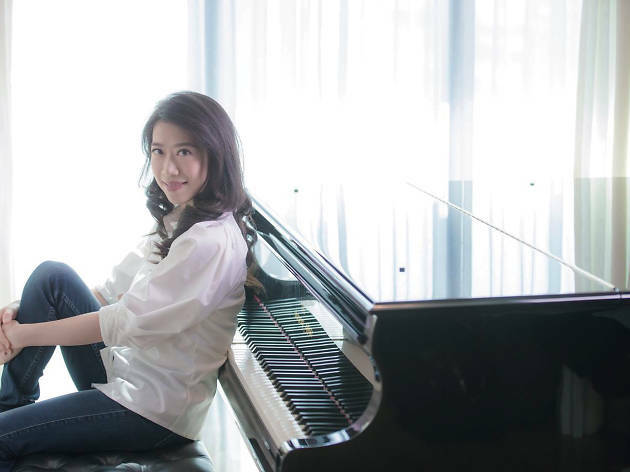 She’s now performed at some of the most renowned concert venues in the world, including Carnegie Hall in New York, so when we sit down with the acclaimed pianist to talk about her relationship with Bach and his legacy, we know we’re in the presence of a homegrown musical maestro. It’s been more than 10 years since you placed sixth in the Chopin competition. What has changed for you since then? I think my identity has changed the most palpably. At that time I was still a student and now that I’m back in Hong Kong, my life is dedicated to performing and teaching. The surreal part is that I’m now teaching at the HKAPA, where I was once a student! It’s quite challenging to be a performer and a teacher at the same time, but it’s also cool because I have proof for my students. When I ask them ‘why didn’t you practice?’, I have to prove to them that I’m also practicing. It’s a commitment, really. Furthermore, I think performance and teaching are interrelated. Performance is very hands-on. You have to extensively research your pieces and inject your creativity into them. Teaching is similar but you meet a lot of people personally instead. I want to build a bridge to inject that inquisitive spirit. You’re playing JS Bach’s Concerto No 5 in F minor at Bach and Beyond. This is a popular piece to perform, isn’t it? This concerto is quite interesting. It’s not very long, which is rare. Also, Bach is able to move devices and motifs to a lot of different areas and contexts without the listener realising. Finally, its instrumentation is quite interesting. It was originally played on a harpsichord and orchestras in those days were very different in shape, giving this concerto a very different texture. Even though the orchestra setting isn’t as full as a modern-day orchestra, it’s still very rich, especially near the end, in the last movement. The movement that sticks out the most to me is the second. All the strings are playing pizzicato and the piano is carrying the main melody. It’s interesting because it’s incredibly difficult for the harpsichord to produce an absolute legato. Perhaps it was done to create a sort of contrast but, overall, it’s so well written that it’s a unique movement. So you’d interpret the piano part in the second movement in legato? It doesn’t say that in particular but there’s research to support that the concerto was originally an oboe piece, which sounds very different to a piano. But, in perspective of the pizzicato of the strings, the contrast would work still. Right. So I imagine if composers wanted long notes back then, they would add a lot of ornaments. But it’s already much improved on modern pianos and, additionally, the tempo can’t be too slow. The modern piano offers more freedom to navigate that interpretation. You’ve mentioned that Bach is one of your favourite composers. How do you view the rest of the Bach and Beyond programme, given that there are many other artists who represent that period? I think this programme is very interesting because, on the surface, it seems like a lot of unrelated composers are being thrown together. But it all has a purpose. It allows people to come and hear Baroque music from a lot of different countries, including England, Germany and France. Of course, Bach affected everyone after him, so it’s important to hear the musicians before him as well. Bach did indeed affect so much music after him. To that end, is it easy to take him for granted? I don’t think I would say that. He was very generous. He left behind so much material for people after him. It’s also incredibly difficult to imitate him. In his time, he had an abnormally huge body of work and his technique was incomparable.